The 21 day fix program was highly successful, and had shown great results for those who undertook the plan. The system is upgraded in 2015, with the new name "21 Day Fix Extreme." Below is information regarding the diet part in this program, providing all that you need to know to start and follow the 21 day fix extreme meal plan. Like most programs for fitness, the 21 day extreme plan has accentuated the importance of nutrition and diet. Within the plan, there are two important things to consider. After you know these, all you need to do is to put one of the approved foods (as listed below) in a corresponding container, which controls the amount of food and calories in it. With so many choices here, it is easy to eat various meals if planed well. Compared to the first 21 Day Fix meal plan, some foods have been added to the meal list, and some have been removed in 21 Day Fix Extreme meal plan. Below is the updated list of foods that can be incorporated into your meal plan. Planning meals with the use of a worksheet will help to precisely plan what to eat and when. This is a great way to ensure that the proper plan is followed, and make it easier to remember what can and cannot be eaten. There are numerous clean eating recipes which can be found online, or you can even devise some at home, using the list of foods above. Ensuring to vary the foods in each meal will help prevent any loss of interest in the meal plan. This point has been noted above. Dividing snacks and meals into color coded containers makes the planning of meals much easier. This should be done for all meals throughout the meal plan. For the majority of people, the easiest meals to plan will be breakfast and snacks. It may be easier to decide what will be eaten for these meals, before deciding what to consume fordinners and then lunch. You can start with the easier ones, then harder ones. Once breakfast and snacks have been planned, it's time to decide what to have for dinners. It is advisable to be creative and keep it fun by always trying new recipes. If there are any leftovers, remember to utilize them for snacks or lunch the next day. As mentioned above, using leftovers for lunch will help ease the planning. Combining salad with leftovers from the night before will be a good idea, making a nutritious and tasty lunch for you. This can be used for all people who are taking 21 day fix extreme meal plan. Spread your consumption of nutrients throughout the day. Use your containers to measure your ingredients and figure out the correct serving size. Try to consume any carbohydrates earlier in the day. Avoid eating carbohydrates or fruits only. Be sure to add fat or protein in the same meal to help keep blood sugar stable. When you find a recipe that you really enjoy, save it, either write it down on paper or save it digitally. List your favorite meals before deciding your meal plan, in order to help make the process easier. 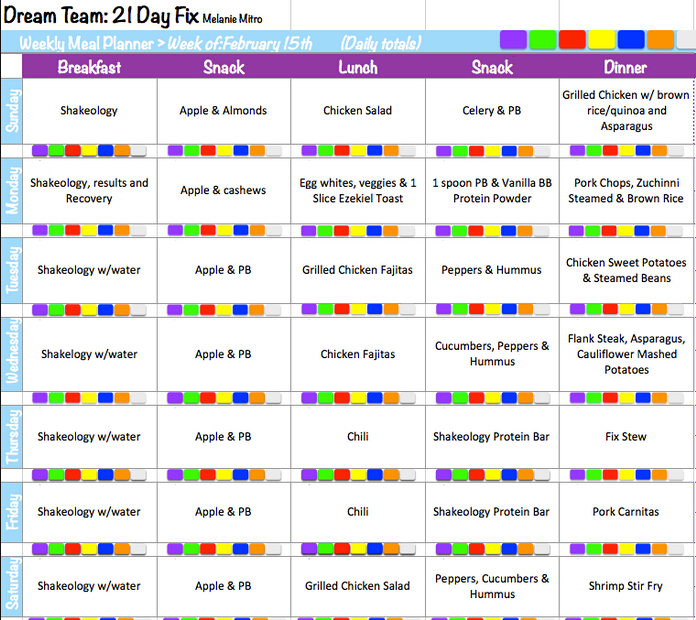 Below is one of 21 Day Fix Extreme meal plan people has made that you can refer to. Curious About Becoming Anorexic? There're Ways to Do That!